After a career as an actor, writer, director and initiator of Theatre-in-Education in both England and Wales, during which he was instrumental in setting up a Wales-wide network of county-based Theatre-in-Education companies, John served 26 years from 1980 with the Arts Council of Wales. He negotiated financial partnerships with local authorities throughout Wales to deliver professional performing arts to villages and local communities through his much copied “Night Out“Scheme. On retirement in 2005 he was awarded MBE for “services to the arts and young people’s theatre in Wales”. 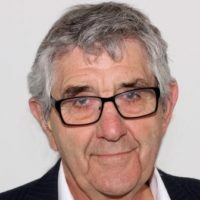 He served as a JP on the Cardiff bench from 1982 to 2002, sitting as Chair mainly in Youth Courts; chaired the Probation Liaison Committee for two years and later served on the Probation Committee. Founder-member of The Friends of Insole Court 1990, chairing its events sub-committee for most of that time. Elected Chairman/ Secretary in 2004 and led campaign against closure during 2006-8. Following reopening of the house, John initiated the HLF “Your Heritage” project in Insole Court (2009-10), with its vision of the Insole story as emblematic of Cardiff’s development; chaired the Project Management Group, and formed the Research Group which informs the Heritage priorities of the current project. Led the public argument that led to the Conservation & Management Study, from which flowed the establishment of the Insole Court Trust. John served on the Llandaff Conservation Advisory Group from 2005 until 2013. He is also a member of the Llandaff Society Committee, a trustee of Hijinx Theatre and a Director of Browning, Jones & Morris Ltd, who have been trading as Builders’ Merchants in Cardiff since 1914.